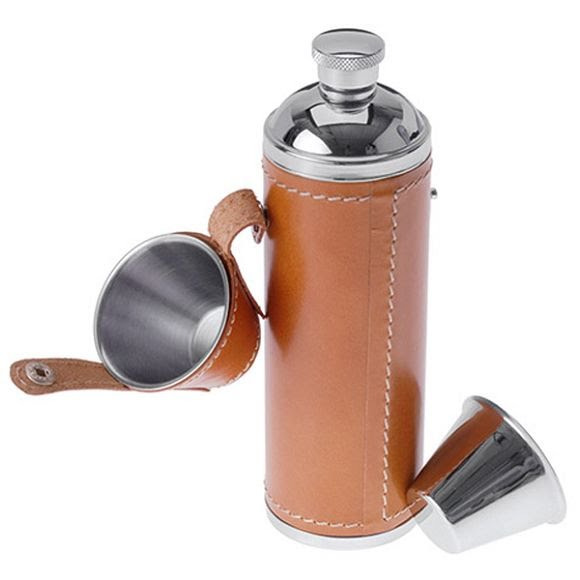 Attractive, compact and pack ready GSI Outdoors' Glacier Stanless Leather Flask is ready to hold 10 oz of your favorite spirit for consuming or cooking. Attractive, compact and pack ready GSI Outdoors &apos; Glacier Stanless Leather Flask is ready to hold 10 oz of your favorite spirit for consuming or cooking. Durable, polished Glacier Stainless finish and leather detailing for a lifetime of use. Snap-on leather cap holds two Glacier Stainless shot cups. When it comes to durable, lightweight kitchenware, thousands of Boy Scouts can&apos;t be wrong. If you need kitchenware that can take a beating and keep on cooking, Glacier Stainless is for you. Each piece is made of high-grade 18/8 stainless steel and built to last for years to come. Measurements 6.9" x 2.2" x 2.1"